Everyone knows that picking house paint colors isn’t just difficult, it’s terrifying! Pick colors that are blah, and your house will seem featureless and flat. But if the colors you pick are too bold, they might overwhelm the architecture…and upset your neighbors. The best colors will highlight the most beautiful features of your home. Skillful use of color can even disguise design flaws, boosting the, “curb appeal” and market value of your home. 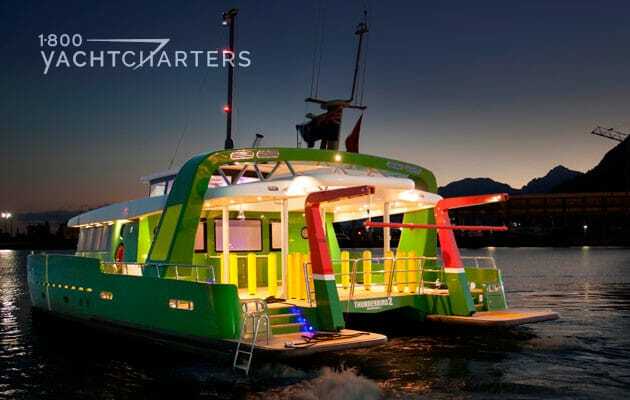 Finding that magic color combination also holds true for luxury mega yacht charter vessels. The first thing a potential client sees when preparing to rent a private yacht is the exterior. The “dock appeal” must catch the attention of the prospect and pique his curiosity to see the interior as well. Traditionally, yachts were painted simply – clean, bright white. With modern technology, new paints and colors that resist fading and the harsh marine environment have been developed. Now, the only limit to the exterior color scheme of a yacht is the owner’s imagination. QUITE ESSENTIAL – With a striking color scheme of Oyster White and Merlot Red, developed by the owner in close collaboration with Dobroserdov Design, Heesen motor yacht Quite Essential will certainly not pass unnoticed in the Mediterranean yacht charter fleet. It is said the red color was inspired by the owner’s love for Merlot wine! SLIPSTREAM – celebrity owner, former American Idol judge, and X-Factor creator Simon Cowell, is known for wearing simple, dark colored T-shirts against pale blue jeans. The classic deep blue hull and gun-blue superstructure of Cowell’s yacht Slipstream sets the scene for a truly nautical and contemporary super yacht. BLACK and WHITE – the distinctive black and white theme onboard motor yacht BLACK AND WHITE is based on the ancient yin yang symbol, a Chinese sign for the mixing of complementary opposites. Launched in 2010, this magnificent Sunseeker 34 yacht mixes not only color, but also high-end amenities and comfort with performance and power. MISTER JINGLES – the global debt crisis has focused great attention on the value of gold. The color gold draws nearly as much attention, especially on a yacht painted stem to stern in this shiny, metallic palette. 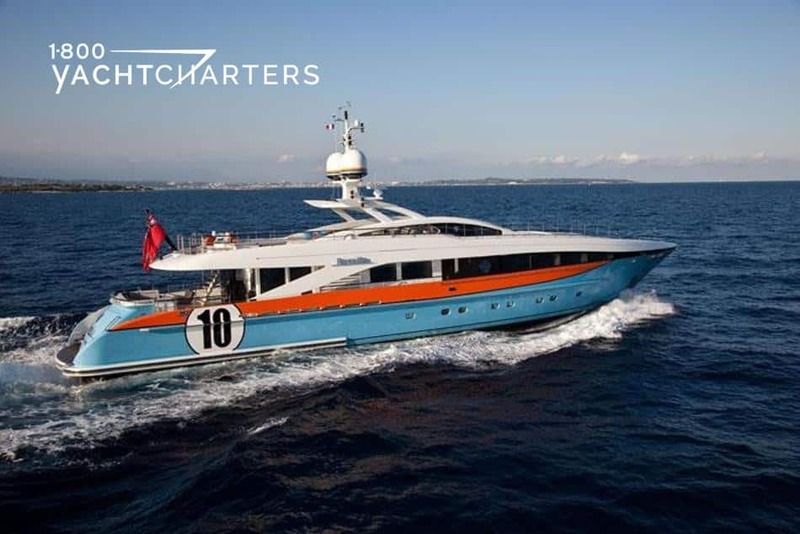 Designed and built by Italy’s Fashion Yachts, motor yacht Mister Jingles debuted as a luxury yacht charter vessel in 2009. 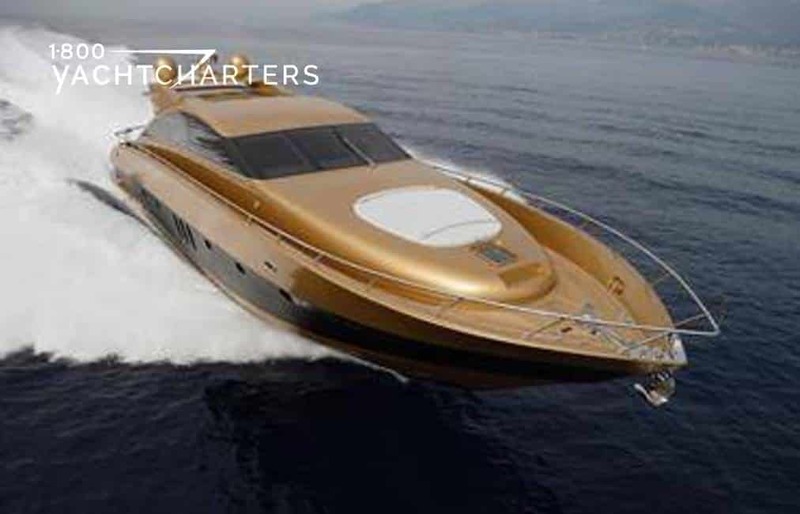 The metallic performance yacht boasts a 35 knot cruising speed – perfect for quickly getting from one famous port to another. AURELIA – recently, we profiled yachts named after race horses by their loving owners. It seems another type of race fan – Formula 1 cars – is just as proud to display his passion on a yacht. 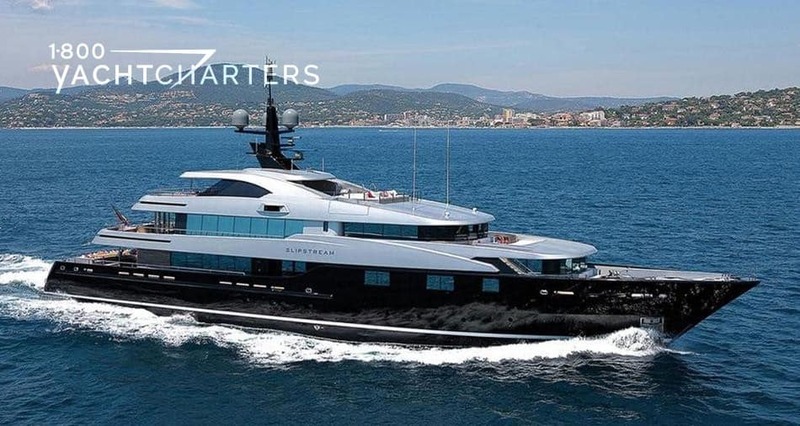 The 37-Meter Heesen motor yacht Aurelia boast an unusual color scheme from Dobroserdov Design, inspired by the owner’s passion for racing cars. Zoom Zoom Zoom! 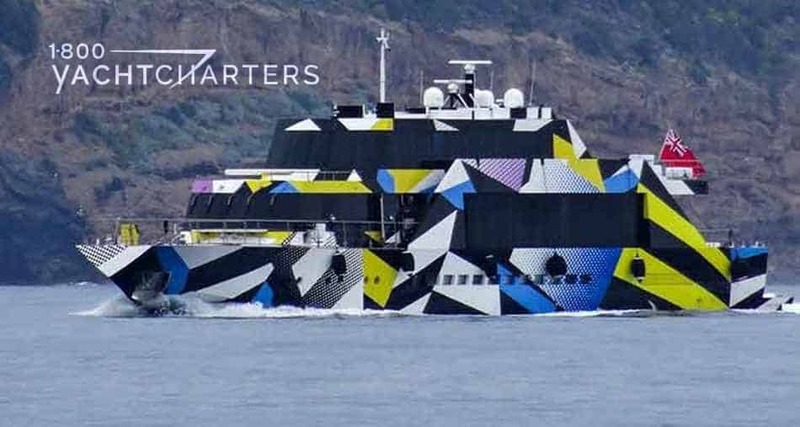 Know of any other yachts with cool paint jobs? 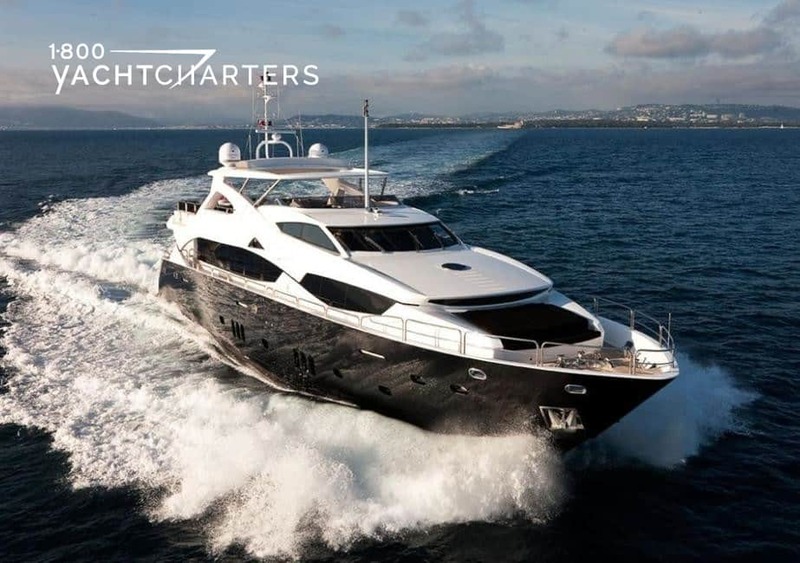 Email us a picture (to info@1800yachtcharters.com ), along with your name, the name of the yacht, and where you saw it. We’ll post and share your pics with our readers! You should add “Thunderbird 2” designed and built by Brilliant Boats. Thank you so much for your comment and for pointing it out to us. I am updating the blog to include Thunderbird 2. Amazing paint job!